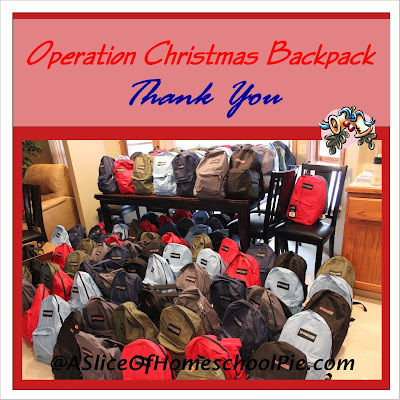 If you have been following my posts concerning Operation Christmas Backpack, you know that our goal this year was to fill 100 backpacks to be distributed among the homeless on Christmas Day. God not only helped us to meet this goal, but also to exceed it. This year we offered families the opportunity to sponsor a backpack for $30. This covered the costs of all of the essential items which went into each backpack. Thanks to the generosity of many families, we were able to fill 120 backpacks (an increase of 76 backpacks from last year)! I want to thank each and every one of you. Thank you for allowing God to use you in a way that will bless many people this Christmas. These were all of the products we included in each backpack. This past weekend several families and friends got together to fill the backpacks. The children were just as involved as the adults. By working in an assembly line fashion, the children walked down the aisle as each adult put items inside their bag. Snacks for the backpacks were provided by COTSCO. A Bible was placed inside each backpack along with a reading light, a Christmas card, and a letter sharing the Good News of Jesus Christ. I loved that the children could be a part of this. They worked really hard and continued going through the line until all the backpacks were filled. We hope that many people will be blessed by this simple act of kindness, but more importantly, that they will come to know and love Jesus. Thank you again to everyone who took a part in this, but most of all I want to thank my Lord for showing His glory through each and every one of you! May you all be blessed this Christmas! It's really amazing what can be done when people work together. What a wonderful project for this giving season!